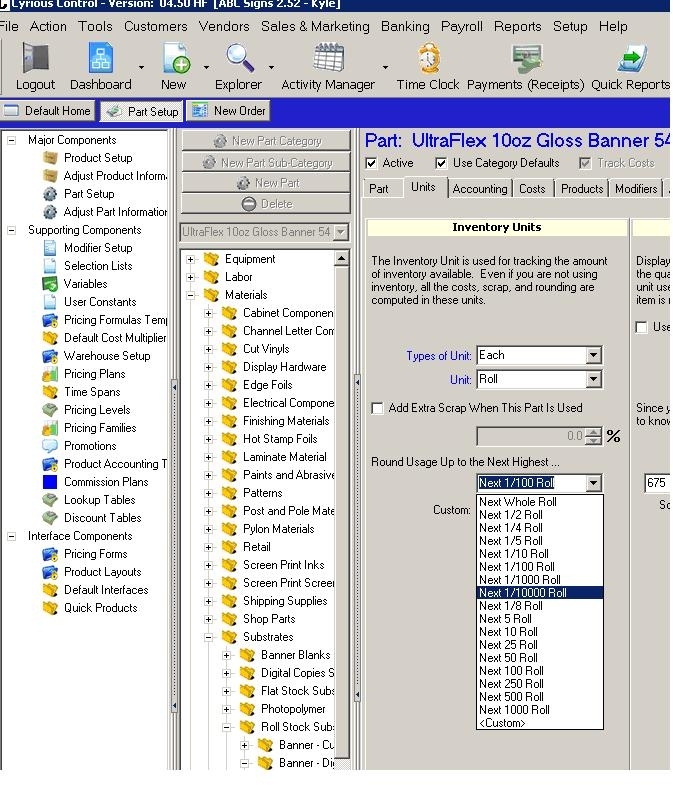 The purpose of this page is to help answer some common questions with regards to using different display units than inventory units for your parts in Control. Why is my part not calculating the correct usage based on my display units conversion? The most common reason that a part doesn't do its display unit conversion correctly is because the default part conversion box for that type of conversion isn't checked. In the last column, “Additional Units”, find the line that lists your conversion, for example using a roll material as inventory units, find the line for ## Sq. Ft. equals 1 Roll. Check the box that says “Defaualt part conversion item”, click OK, then click on Save on the right action bar. This should tell the system that this is the part conversion you want to use when calculating out the usage. The line that you want to modify will always be the line that matches the unit that you specified in the column for “Display Units”, so if in the above example my display unit was feet instead of sq. ft., I would've used the additional unit conversion line for ## feet equals 1 roll instead. Why does my part override to a different value if I try to use a different display unit value? When using different display units, you may notice some odd behavior when you try to override the estimated usage when you're showing the display units. For this example, we'll be assuming a roll part with inventory units of rolls, but display units of sq. feet, with a conversion factor of 675 sq. feet equals 1 roll. If you're doing an order that uses this part, and you go to look at the parts tab and it says you're going to use an estimated 6.75 sq. feet. If you attempt to override this estimated usage to 10 sq. feet, you may notice that instead of 10, the value overrides to be 13.5. This is because of the rounding value that is set on the Inventory unit. Display units are dependant of the rounding that's set on the inventory unit. If the rounding is set to only 1/100th of a roll, the system will round the roll usage to the nearest 0.01, but still display the sq. footage to whatever it calculates to be. In the example above, when attempting to set the sq. footage to 10, the rounding doesn't support that, so it rounds up to the next 1/100th, or in this case, 0.02. The best way to alleviate this is to change the rounding value that's used on this part. This problem is most prevalent in large conversions where small inventory values are common.